I am glad to be able to reach you through these pages. In my website, I am going to share the studies that I did and contributed to my surgical life,with you. I will update my pages as frequent as I can. At this point, your comments and requests would guide me. You can send me all your comments and requests via e-mail. Prof. Dr. Vahit Ozmen has written a new book titled “Breast Cancer in Turkey: Analyses of 20.000 Patients with Breast Cancer”. 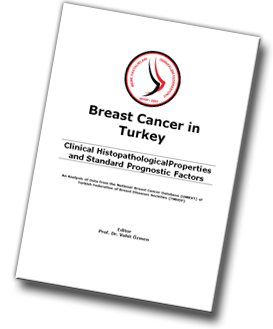 Prof. Dr. Vahit Ozmen has written a new book titled “Breast Cancer in Turkey” “Clinical Histopathological Characteristics and Standard Prognostic Factors”. 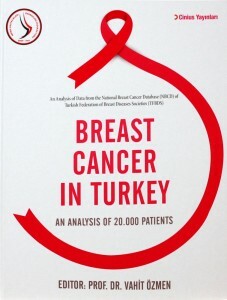 This book includes analyses of 13.420 breast cancer patients from the National Breast Cancer Database (UMKVT) of Turkish Federation of Breast Diseases Societies (TMHDF). Primary aims of this publication were to reflect the results of analyses of breast cancer patients by gender, age, menopausal status, clinical and pathological stages, histological type of invasive cancer, tumor diameter, histological grade, pathological lymphatic stage, hormone receptor, HER (c erb B2) expression and molecular subtype of breast cancer. These results were also compared with the results of developed and developing countries.